Van van is derived from the french-Louisiana pronunciation of vervain as "vaah vahn". 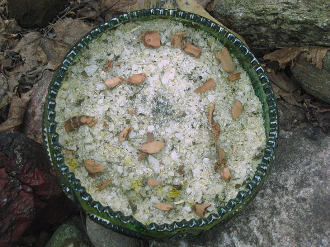 It is traditionally created from 5 oriental plants; citronella, vervain, lemongrass, galangal, and patchouli. Though recipes vary slightly from worker to worker. All van van should contain lemongrass, some contain ginger or gingergrass. These salts contains epsom salt to get that dose of magnesium we all need, plus they are pain relieving and reduce swelling and bruising. Natural sea salt, patchouli and lemongrass essential oils, galangal root, patchouli, lemongrass, vervain, ginger root and pyrite gravel for an extra kick in yo magical business! Van Van may be THE most famous hoodoo name. It is an all purpose, super cleansing, ultra powerful stuff. Use these salts in your bath or scatter around your home before sweeping or vacuuming or put a line across your front porch or steps. I created my Van Van salts as many spells call for them as a step in the process and I want you to be able to make your hoodoo do what it do;) You will receive a 4 ounce plastic bottle of salts, made fresh for you. feedback; "These bath salts are some of my favorite! They smell amazing and I feel like a brand new person after using them." "I "dress" my handbag with this or put it a bit in my pants pocket! So positive!" ashe'! curio only.